The EDAC 516 Series connector can be configured for cable-to-board /panel or cable-to-cable applications. An actuating screw and nutlock which can be fitted to either the plug or the receptacle facilitates mating and provides a secure, reliable and robust interconnect. The 8.5 amp, 516 series, connectors are available in five circuit sizes 20, 38, 56, 90 and 120. The 56 circuit version of the EDAC 516 connector series with EMI/RFI shielding device and metal cover ~ types plug and receptacle are as shown below with either actuating screw or locknut. The superbly engineered, 8.5 Amp tuning fork type hermaphroditic contact is available with crimp; solder eye; pcb or wire wrap tail. At the heart of the 516 series design is the gold-plated hermaphroditic contact with four gas-tight, mating surfaces with a long wiping length for self-cleaning as shown below (this helps to alleviate the chance of any increased electrical resistance). In addition to the excellent heat dissipation characteristics of the contact, the inherent ‘spring’ design also ensures that if contact pressure from two surfaces is reduced for any reason, the pressure on the other two surfaces is proportionally increased. This is very relevant when the connector is used in high shock/vibration applications like Off-Shore wind turbines. This exceptional contact design has a forty-plus year pedigree of outstanding reliability and performance in numerous safety and mission-critical applications including oil and gas processing, off-shore alternative energy production and railway signalling. EDAC Series 516 are even incorporated into sensor devices installed in the CERN European nuclear physics project. Actuating screws, locknuts, polarising hardware, covers and contacts suitable for either plug or receptacle. Design engineers, in growing numbers, are recognising the proven reliability track record of the 516 Series when seeking the ideal interconnect system for products used in safety-related and/or harsh-environment applications. For example, Network Rail, the UK railway infrastructure authority, has issued its Certificate of Acceptance for EDAC’s 516 Series connectors to be used with signalling and level crossing control panels, transmission systems and associated information systems. The hardware features of the EDAC 516 Series allow 288 different polarising combinations ensuring the right plug can noly be mated with the right receptacle when a bank of connectors is arrayed. 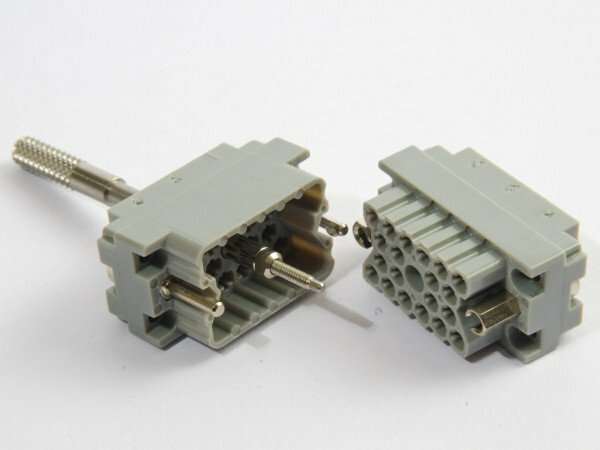 Thirty-one part numbers in the 516 Series range of multi-pin connectors have been issued with official Network Rail PADS numbers (Parts And Drawing System). Metal top or side entry covers for the five available circuit sizes (20, 38, 56, 90 and 120) are available to further enhance the robustness and durability of the product. The Edac 516 series is a direct – fit/form/function – alternative to the Elco or Varleco 8016 types.